You are currently browsing the tag archive for the ‘Jack Tworkov’ tag. This has been a summer of enjoying the art reviews of Sebastian Smee in the Boston Globe. (Before coming to the Globe, Smee has wrote for The Australian, the Daily Telegraph, The Guardian, The Times, The Financial Times, The Independent on Sunday, The Art Newspaper and Modern Painters. He is also the author of a book on Lucian Freud.) Boston is lucky to have him. When a talented artist ends up being regarded by posterity as less than great, it’s often because he or she never came to be identified with a single style. At least that’s the excuse that’s often proffered. 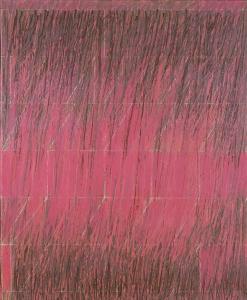 The implied critique of some who are remembered as great — that they allowed their creativity to be reduced to the factory-style production of signature images — hits a nerve: Think of Mark Rothko’s endlessly repeated rectangular lozenges, Clyfford Still’s jagged shapes, Barnett Newman’s “zips,’’ and so on. How many vertical strips against monochrome backgrounds are needed to make a point? Although Tworkov is categorized as an Abstract Expressionist and treated Willem de Kooning as a mentor, Tworkov wasn’t wired like the rest of that crew. He was more willing to embrace doubt, to question himself. He also avoided the bombastic and often self destructive behavior that was so prevalent among many of his peers. There is a stepped away quality to Tworkov, in his work and in his approach to art. Or maybe it was a form of humility. Whatever term is used for that particular quality, its meaningfulness in the evolution of his work is very compelling to me. Tworkov’s interest in expressing himself verbally never left him. His journals (selected and edited by Mira Schor in a Yale University Press volume last year) contain some of the most eloquent and insightful writings of the period. They are blessedly free, moreover, of the bombast and prolixity of artists like Robert Motherwell, Rothko, and Newman. Where Pollock’s response to a similar apprehension seems to have been a steep increase in alcohol intake and a suicidal car trip, Tworkov was able to switch to a lower gear. And so around the time he took up a teaching post at Yale (where he transformed the art program into one of the best in the country) he started making works that were based on straight-lined geometries, especially grids. Doubters. They are often the ones who will let the story be told with more honesty, with more self-effacing candor. And in that sense it is an energy that I am drawn to deeply.